The Maji Beach Boutique Hotel is a 5 Star multi award winning property, consistently rated n.1 in Kenya for Luxury and Service by Trip Advisor. The Maji Beach Boutique Hotel is located on the sandy shores of Diani Beach on the South Coast of Kenya and features 15 unique and individually designed bedrooms and Suites. The eclectic décor blends the old and the new, the use of local natural materials, driftwood, colonial and Swahili antiques, mixed with original tribal handicrafts and modern African paintings give to the property an intriguing taste of Africa. The Maji features a meandering moat-like swimming pool running through and around the main house, an open air Jacuzzi, numerous “al fresco” dining options with views over the clear azure waters of the Indian Ocean, a coffee lounge, The Maji Moto bar, games room, indoor air-conditioned dining room, mini-gym with an ocean view and The Moringa Spa Cabin and treatment room. The beachfront and garden is furnished with double and single sunbeds. A variety of excursions and activities such as kite surfing, sky diving, golf, snorkeling, dolphin safari’s, cultural tours, SUP’s, wind surfing, Deep sea fishing, scuba diving, Mombasa and Shimba Hills excursions can be arranged. The property can be booked on half board or full board options. Children over 12 years are welcome at all times and under 12 years on exclusive use basis only. The Maji Beach Boutique Hotel is situated in Diani on the northern part of the award winning Diani Beach on the south coast of Kenya. Diani lies about 30km south of the historic coastal port town of Mombasa at just 4 degrees south of the equator. Diani Beach is approximately 17 kilometres long from the Kongo River mouth (just a few kilometres north of The Maji Beach Boutique Hotel) down to Galu Beach to the south. It is adjacent to the town of Ukunda in Kwale County. The area is known for its palm fringed beaches, coral reefs, colobus monkeys and is a popular beach holiday destination in Kenya. We believe that the way forward for sustainability of our planet is to practice responsible tourism. The protection of our wildlife and its environment as well as the human wildlife conflict is one of the greatest challenges we face. At The Maji Beach Boutique Hotel we are determined and committed to do our part in minimizing our impact on our surroundings, caring for wildlife and reducing our carbon footprint. In collaboration with Diani & Watamu Turtle Watch, The Maji Beach Boutique Hotel has its own guarded Turtle Hatchery & Protection Zone. Along with trained monitors, The Maji works together to help protect Turtles along our coastline by assisting in programs such as monitoring, nest relocation & protection. All our guests have the opportunity to directly contribute to the program simply by staying at The Maji & many are lucky enough to witness hatchings right in front of the hotel. Other initiatives include regular beach cleanups amongst our staff as well as involving the local community, discouraging the illegal shell trade on our beaches, protecting & discouraging the destruction of the coral & other marine life & ensuring that all seafood used in the hotel kitchen is measured & weighed in line with welfare guidelines to ensure sustainability. The Maji supports many women’s groups, charities, orphanages and self-help groups locally. We are an equal rights employer and have a popular in house training scheme. We employ many from the local community & The Maji works closely & supports a number of organizations such as Mama Lorenza, Child to Child for Africa Foundation in Diani where we provide hands on training & exposure to their scholars interested in the hospitality sector, arranging visits & guest involvement & support. In aiming to reduce the impact on our environment at The Maji we try to recycle our waste as much as possible. We have a Bio waste water recycling plant, we make our own garden compost, we separate our trash & ensure it is recycled responsibly, we use solar energy & eco biodegradable cleaning & laundry products as well as providing handmade luxury Eco products to our guests from local cottage industries. At “The Maji” we believe that people are what make an experience. Our team is a dedicated family and together we work on ensuring that your holiday is about you, the way you like it. The Maji Beach Boutique Hotel is owned by Sansone and Caterina Banin. Sansone is a long time hotelier and entrepreneur and Caterina an interior designer by profession. Their combined wealth of experience gained over decades of designing, developing and managing prestigious hotels in various countries in Europe, the Middle East and Africa, was invested in conceiving and producing this unusual property, offering understated luxury with a personalized, refreshing style of hospitality. At The Maji Beach Boutique Hotel 60 dedicated, discreet and professional members of staff have the mission to make each guest enjoy an unforgettable experience. 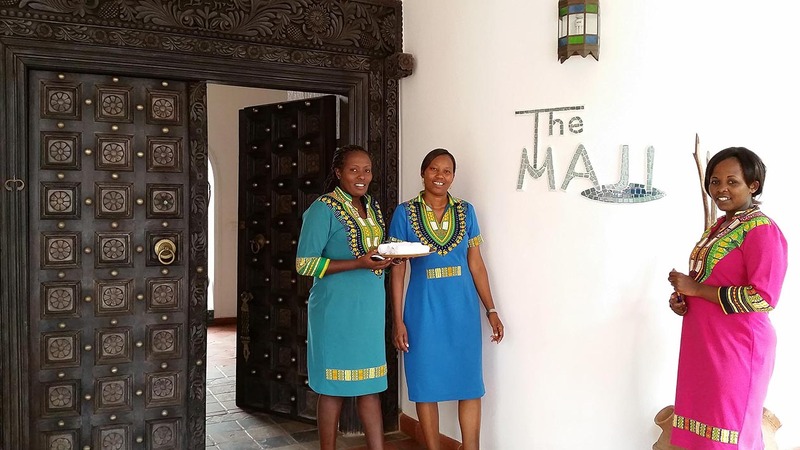 The team, made up of women and men from all corners of Kenya, is headed by the general manager Lara Hammond and her assistant manager Zipporah Kanyi, both with many years of experience in the luxury hospitality sector in East Africa. Together they carry the demanding challenge of maintaining and bettering the exceptionally high standards that has won The Maji Beach Boutique Hotel several Trip Advisor awards.